Dark features on Mars previously considered evidence for subsurface flowing of water are interpreted by new research as granular flows, where grains of sand and dust slip downhill to make dark streaks, rather than the ground being darkened by seeping water. Continuing examination of these still-perplexing seasonal dark streaks with a powerful camera on NASA’s Mars Reconnaissance Orbiter (MRO) shows they exist only on slopes steep enough for dry grains to descend the way they do on faces of active dunes. The findings published in Nature Geoscience argue against the presence of enough liquid water for microbial life to thrive at these sites. However, exactly how these numerous flows begin and gradually grow has not yet been explained. Authors of the report propose possibilities that include involvement of small amounts of water, indicated by detection of hydrated salts observed at some of the flow sites. These features have evoked fascination and controversy since their 2011 discovery, as possible markers for unexpected liquid water or brine on an otherwise dry planet. They are dark streaks that extend gradually downhill in warm seasons, then fade away in winter and reappear the next year. On Earth, only seeping water is known to have these behaviors, but how they form in the dry Martian environment remains unclear. Many thousands of these Martian features, collectively called “recurring slope lineae” or RSL, have been identified in more than 50 rocky-slope areas, from the equator to about halfway to the poles. Dundas is lead author of the report, which is based on observations with the High Resolution Imaging Science Experiment (HiRISE) camera on MRO. The data include 3-D models of slope steepness using pairs of images for stereo information. Dundas and co-authors examined 151 RSL features at 10 sites. The RSL are almost all restricted to slopes steeper than 27 degrees. Each flow ends on a slope that matches the dynamic “angle of repose” seen in the slumping dry sand of dunes on Mars and Earth. A flow due to liquid water should readily extend to less steep slopes. “The RSL don’t flow onto shallower slopes, and the lengths of these are so closely correlated with the dynamic angle of repose, it can’t be a coincidence,” said HiRISE Principal Investigator Alfred McEwen at the University of Arizona, Tucson, a co-author of the new report. The seasonal dark streaks have been thought of as possible evidence for biologically significant liquid water — sufficient water for microbial life — though explaining how so much liquid water could exist on the surface in Mars’ modern environment would be challenging. A granular-flow explanation for RSL fits with the earlier understanding that the surface of modern Mars, exposed to a cold, thin atmosphere, lacks flowing water. A 2016 report also cast doubt on possible sources of underground water at RSL sites. Liquid water on today’s Mars may be limited to traces of dissolved moisture from the atmosphere and thin films, which are challenging environments for life as we know it. However, RSL remain puzzling. Traits with uncertain explanations include their gradual growth, their seasonal reappearance, their rapid fading when inactive, and the presence of hydrated salts, which have water molecules bound into their crystal stucture. The new report describes possible connections between these traits and how RSL form. For example, salts can become hydrated by pulling water vapor from the atmosphere, and this process can form drops of salty water. Seasonal changes in hydration of salt-containing grains might result in some trigger mechanism for RSL grainflows, such as expansion, contraction, or release of some water. Darkening and fading might result from changes in hydration. If atmospheric water vapor is a trigger, then a question is why the RSL appear on some slopes but not others. The University of Arizona operates HiRISE, which was built by Ball Aerospace & Technologies Corp., Boulder, Colorado. JPL, a division of Caltech in Pasadena, California, manages the MRO Project for the NASA Science Mission Directorate in Washington. Lockheed Martin Space Systems of Denver built the orbiter and supports its operations. 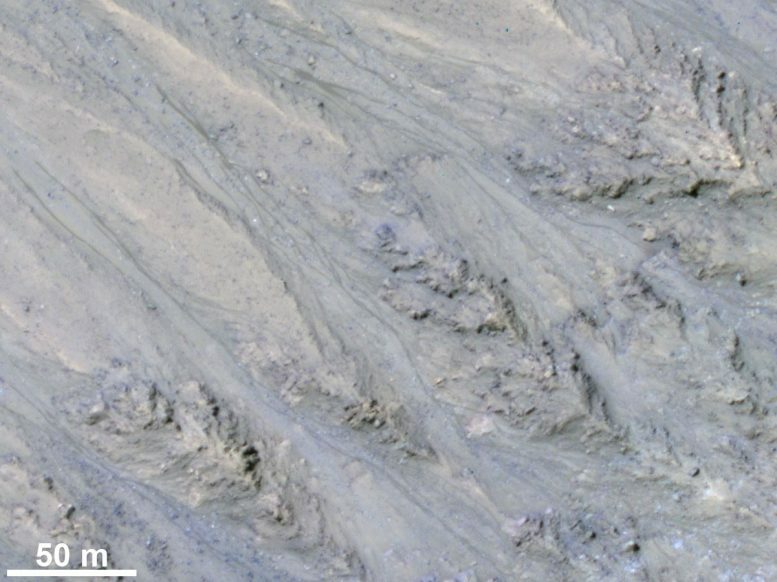 Be the first to comment on "MRO Shows That Recurring Martian Streaks Are Flowing Sand, Not Water"